What are the Average Electricity Costs for Small Business in Australia? What are the Average Electricity Costs for a Small Business in Australia? Compare and Switch Today! Increasing electricity costs have the potential to damage business growth. Both business and residential energy customers alike are feeling the pinch of increased costs. What determines the average utility costs for small business in Australia? Let’s find out. 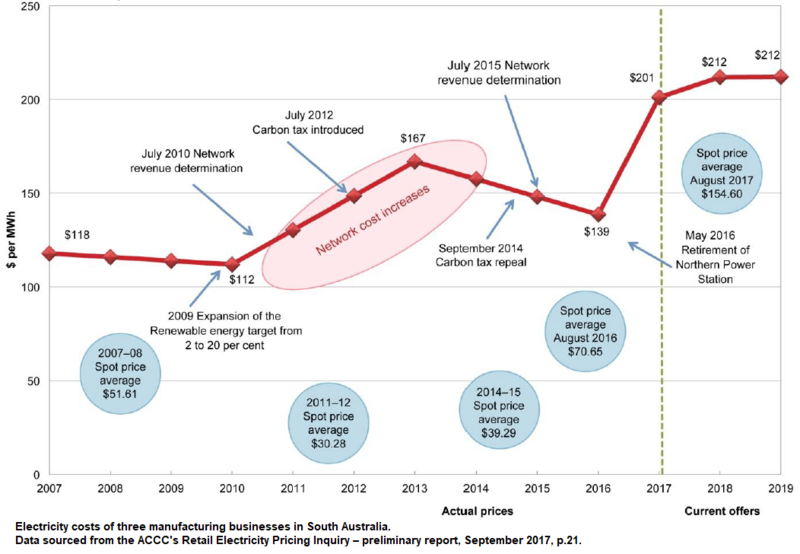 The ACCC has found that overall increases in network costs on top of wholesale electricity price increases have seen prices to businesses double from 2007 to 2017. Government tariffs and taxes, changing network infrastructure, and retail prices all have the potential to increase business electricity costs. Price drivers influencing the total cost of electricity for three South Australian manufacturing businesses. In Australia, small businesses are an integral part of the local economy. While more Australian small businesses reported a growth in profits over the last year compared with the years since 2014, the Energy Consumers Australia office found that small business electricity bills are unsustainable. While customers are urged to support local businesses to boost the Australian economy, it’s also critical for small business owners to budget wisely in order to minimise overhead costs. One way to do so is by taking advantage of affordable utility rates that will lower quarterly power bills to make monthly expenses more manageable. Business owners should shop around and find the cheapest electricity retailer for their business. One quick way for small business customers to potentially save on annual energy is to compare and make the switch to a cheaper local retailer! Electricity Wizard will provide you with a free quote, available at no obligation to you, in just minutes. Businesses hoping to keep utility costs low can start out with a quick electricity comparison to receive a no-obligation quote in a matter of minutes. Find a better daily electricity supply rate and find a much cheaper kWh usage rate for your business with our comparison tools. Electricity Wizard has already helped over 1 Million customers to compare the average electricity costs of small business. Get a free quote and save now on your Small Business utility costs. Just call us directly at 1300 359 779 or fill out the form below for more information. One of our friendly customer service representatives will be happy to walk you step-by-step through the process. You can quickly compare rates and take advantage of more affordable energy prices in your area. Electricity Wizard will do the hard work for you. Our aim is to assist you lower your power bills dramatically. Call us to make the switch today! Electricity Wizard allows you to quickly and conveniently compare a range of electricity providers and plans in your area. One of our trained specialists can help you look through and analyse many of the available rates and options in your service region so that you can choose a plan that better meets your needs. We are here to help you save money with your business expenses. Our website allows you to quickly browse the offers available from Australia’s best electricity providers. We list the benefits of each electricity retailer, can help you save on connection fees, lock in low rates, or find providers that offer no-contract options.